As a marketing symbol, you can’t get much more potent than the apple. That remarkably simple and instantly recognisable image of an apple with a single bite taken out is now as ubiquitous as a can of Pepsi or – in Vientiane at least – a bottle of Beerlao. But when it comes to consumers, devotees of Apple’s carefully curated line of products generally care about one thing – where can they get the real deal? And where, if their real-deal devices break, can they get them properly repaired? While Vientiane is now dotted with the Apple symbol, most adorn shops that supply Apple products bought in Thailand, and don’t provide any user support. Others are on shops that have good deals with other “grey market” resellers. But, thankfully, there is one authorised distributor of Apple products in Laos – the LTH Store, the electronics distributor that also imports Nokia, Samsung, Toshiba, Philips, Faber, among others. Carine Prinsitthirat knows her phones. Her father owns L Thong Huot, and her family has long cornered the electronics and mobile phone market in Laos. Born and raised in France, Mrs Prinsitthirat moved to Laos with her parents when she was 15, and studied international business management in Thailand, destined for life at the helm of a large company. So she has been able to watch the rise and rise of the mobile phone market in Laos, beginning with Nokia in the early 2000s. By the time the iPhone stormed the world in 2008, Nokia had a solid hold on the Lao market, with the massive logo-ed store on Dongpalane road a beacon for users everywhere of the real thing. Today, nine years later, the old Nokia store has been combined with the main LTH shop (LTH Store shop), with Samsung is next door and Apple right across the street. LTH owns all of them but, says Mrs Prinsitthirat, convincing Apple to let LTH sell its authorised products was no easy matter. LTH were initially able to sell Apple products in a small corner of one of its electronics stores, to see how they fared on the market. In this context, the company’s experience selling Nokia and Samsung was a help, rather than a hindrance, and in fact, according to Mrs Prinsitthirat, most Apple sellers deal Samsung phones as well. And besides, she says, the Apple market is unlike any other on the tech scene. “The target market is different,” she says. 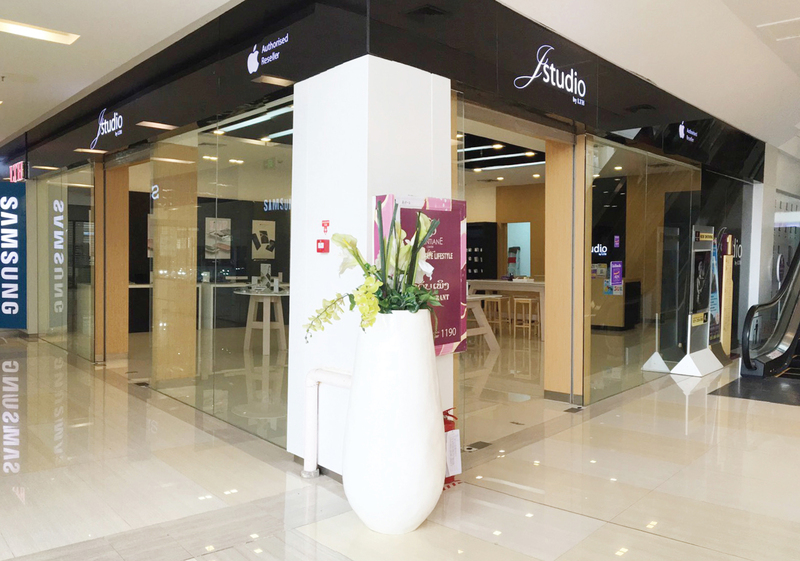 Once it was clear there was a strong market – that is, enough customers with means to indulge in their love of fine tech design – LTH was allowed to open a J Studio & LTH (JStudio by LTH), devoted exclusively to Apple products – complete with the trademark, blond-wood-and-chrome trademark fitout – in Vientiane Center. The licence to sell iPhones comes with access to authorised service providers from Apple, and she has been impressed at the quality of the service provided, especially for products needing repairs or replacements. “Actually the system is very good, Apple provides everything.’’ she says. She says that as a Lao person, opening an Apple Authorised Reseller store is a dream come true – at just 24, she fits solidly into the iPhone generation. Her next ambition is to become an Apple Premium Reseller, meaning the store can sell the latest products, including the increasingly-sought-after Apple Watch.